STAMFORD, Conn. – June 29, 2015 – NBC Sports Group tapped country music superstar Blake Shelton to perform his hit “Bringing Back the Sunshine,” within the opening theme of its NASCAR Sprint Cup Series coverage this season on NBC and NBCSN. Shelton, a judge on NBC’s The Voice, makes his NASCAR on NBC debut on Sunday, July 5th at 7 p.m. ET, prior to coverage of the Coke Zero 400 Powered by Coca-Cola NASCAR Sprint Cup Series race. Marking a first for any NBC Sports open, the complete number is available for view prior to its network television debut via the NASCARonNBC Facebook and Twitter accounts (click on either link to view the NBC Sports NASCAR open featuring Blake Shelton). The opening theme package will be updated throughout the remainder of the season with fresh faces, updated footage of action on the track and scenic visuals of NASCAR’s storied venues, getting viewers geared up for NASCAR Sprint Cup action. via COUNTRY MUSIC SUPERSTAR BLAKE SHELTON PERFORMS “BRINGING BACK THE SUNSHINE” FOR NBC SPORTS’ NASCAR SPRINT CUP OPENING THEME | NBC Sports Pressbox. Here’s what it takes to launch NASCAR on NBC. STAMFORD, Conn. – June 26, 2015 – NBC Sports Group’s multiplatform coverage of NASCAR Sprint Cup and XFINITY Series racing is gearing up in a big way over 4th of July weekend. Coverage begins Saturday, July 4th, at 7 p.m. ET with the Subway Firecracker 250 NASCAR XFINITY Series race on NBCSN. On Sunday evening, NBC presents the 57th running of the Coke Zero 400 Powered by Coca-Cola NASCAR Sprint Cup Series race at 7 p.m. ET. The events wave the green flag over NBC Sports Group’s 10-year chapter as the home of NASCAR’s championship run, and NBC Sports’ production team in Daytona will employ a crew of more than 195 personnel, 70 cameras, and a wide collection of other tools to deliver the action. via NBC SPORTS’ 4TH OF JULY WEEKEND NASCAR LAUNCH BY THE NUMBERS | NBC Sports Pressbox. Author rjbaileyPosted on June 26, 2015 Categories UncategorizedTags NASCAR, NBC, NBC SportsLeave a comment on Here’s what it takes to launch NASCAR on NBC. It’s different – very different – from anything NASCAR has done in its history. The 10-race championship format used from 2004-13 has been replaced by a series of three-race mini-seasons where four drivers are eliminated each time, followed by a points reset. Then the title will be decided among four remaining drivers in the Nov. 16 championship race at Homestead-Miami Speedway. via NASCAR drivers support new Chase despite peculiarities. “Mars Chocolate North America announced today that Cynthia Peace of Havana, Ill., was selected as the grand prize winner of “M&M’S® Most Colorful Fan® of NASCAR® Contest.” Peace bested thousands of other colorful NASCAR fans who participated in the 24-week contest. “DAYTONA BEACH , Fla., Sept. 21 /PRNewswire-FirstCall/ — For over 50 years, Daytona Beach has been the mecca of motorsports racing due to the vision of ‘Big’ Bill France. Where there was nothing but open fields and saw grass, he envisioned huge crowds cheering the fastest cars and drivers racing at a spectacular world-class facility. Through the France Family’s hard work, the ‘Great American Race,’ the Daytona 500, put Daytona Beach on the global sports map. “ATLANTA, July 30 /PRNewswire-FirstCall/ — Aaron’s, Inc. of Atlanta, GA (NYSE: AAN), the Aaron’s Outdoors television program and Mossy Oak Brand Camo have teamed together to produce a unique marketing campaign that features specialty paint schemes on three NASCAR racecars and a national register-to-win sweepstakes. Aaron’s will replace its familiar Aaron’s Dream Machine paint schemes with Mossy Oak patterned camouflage and prominently feature the Aaron’s Outdoors logo on the hood and TV panel of the racecars. To help promote the special paint schemes, Aaron’s has also developed a national register-to-win sweepstakes that will award nine grand prize winners camouflaged replica race helmets, each autographed by the three drivers who will pilot the cars. 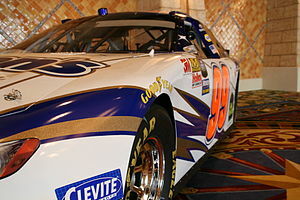 “The first of these special paint schemes will premiere on the Michael Waltrip Racing (MWR) No. 00 NASCAR Sprint Cup Series Aaron’s Dream Machine driven by David Reutimann at the Pep Boys Auto 500 at Atlanta Motor Speedway on September 6, 2009. The paint scheme will again be featured on the R3 Motorsports No. 23 NASCAR Nationwide Series racecar driven by Ken Butler III in the Dollar General 300 at Lowe’s Motor Speedway on October 16. The final paint scheme can be seen on the MWR NASCAR Nationwide Series No. 99 driven by Trevor Bayne in the O’Reilly Challenge at Texas Motor Speedway on November 7.